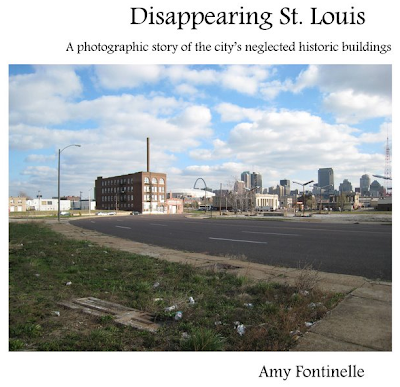 Photographer and writer Amy Fontinelle of Seeing St. Louis has published Disappearing St. Louis, a new book that portrays the extremely fragile condition of abandoned historic buildings in St. Louis neighborhoods including Old North St. Louis, Vandeventer, Fountain Park, Academy, JeffVanderLou, and Hyde Park. With a similar mindset of this site, Amy has produced the book to bring greater awareness to the plight of these irreplaceable architectural treasures and their surrounding neighborhoods. 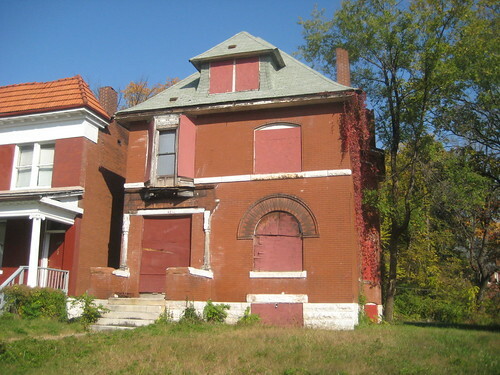 Amy is donating all profits from the sale of the book to the Old North St. Louis Restoration Group, which in recent years along with dedicated residents has taken the leading role in re-building in re-building the tattered neighborhood. The book is available here via Seeing St. Louis, and may also be purchased at the 5th annual Rock N Roll Craft Show which will take place Friday through Sunday this weekend at Third Degree Glass, just east of Union on Delmar... a perfect way to start your holiday shopping after recovering from turkey and pecan pie coma on Thursday. Happy Thanksgiving! At the last moment at this evenings Preservation Board meeting during the presentation of the proposal for the Corner Building at Delmar & Skinker, representatives of Washington University announced that the proposal to demolish the ones story retail building is on hold so that the University can explore other options. The renovation of the Corner Building will move forward, and approval was given for installation of wind turbines on the roof. After the their agenda item was passed Cheryl Adelstein, Director of Community Relations for the University came over to Michael Allen and myself and asked if demolition of the building would be acceptable if the University built a larger building on the site. The new building might contain parking underground or at the rear of the first floor dedicated for the apartments. Both of us agreed that this could potentially be more palatable. The existing building itself, while complimenting the building next door is not a highly significant piece of architecture, and a well designed new larger structure extending all the way to the Enright corner could improve the streetscape. This particular issue is more about preserving density and streetscape along Skinker and preventing the large parking area behind from becoming more visible. 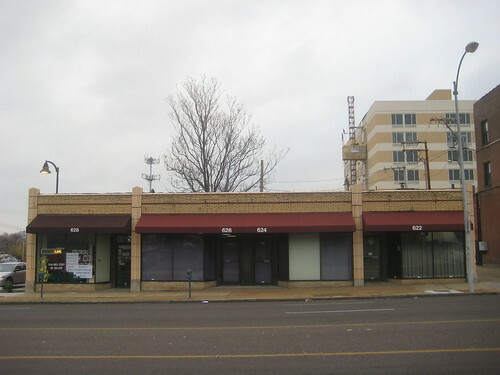 Keeping some retail use on the ground floor however would be preferable in a new building. On other agenda items this evening, the board voted for preservation of 5115 Cates, and postponed hearing about 1826 Warren due to the absence of the applicant. Washington University is proposing demolition of this 1936 Art Deco retail building on Skinker The building does a great job of screening the giant sea of parking beyond from view on Skinker. 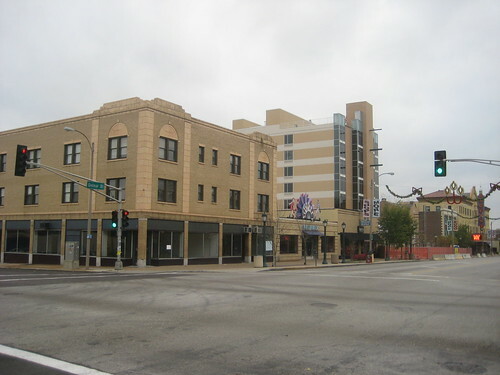 The building lies just north of another Art Deco building at the northeast corner of Delmar and Skinker that Wash U is proposing to renovate for student apartments above retail space. The proposal for both the renovation, which would include the addition of vertical wind turbines on the roof, and the demolition of the one story retail building is on the agenda for next Monday's Preservation Board meeting. Preservation board meetings are held on the 12th floor of the 1015 Locust Building and are open to the public. 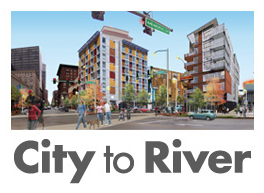 Attendees may address the Preservation Board to give their opinions about each proposal. The Corner Building, as Wash U is going to name the project (I do not believe the building had a name previously) is just west of the Pin-up Bowl and Joe Edward's new Moonrise Hotel. 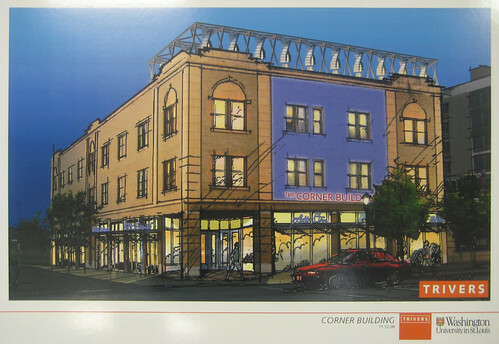 A rendering from Trivers shows the proposed wind turbines on the roof which would be visible on Delmar and would possibly be lit at night. No, they are not going to paint the middle of the building purple, instead the rendering depicts colored LED lights which would light a portion of the facade, adding some color to the building at night similar to the way the recently renovated Woolworth's building at Grand and Olive is lit. Personally, I think both the wind turbines, which will generate a portion of the electricity for the building, and the LED lights proposed will both be interesting additions to the building, and go well with the eclectic mix of neon signs such as the one at the Pin-up, and at the Pageant. Demolition of the building to the building to the north, however is completely unnecessary. 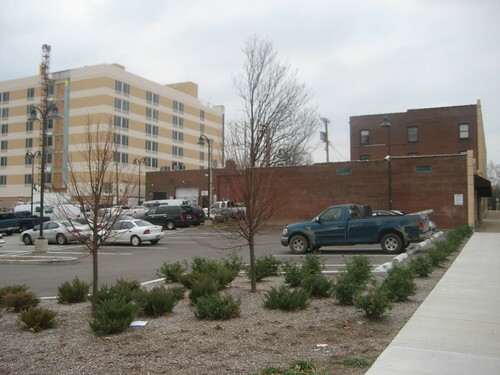 The parking area north of the one story building would provide about 24 spaces, which for the 16 apartments proposed, would be more than adequate. 1.5 dedicated parking spaces per unit is higher than the zoning requirement, higher than most if not all existing Wash U apartments in the area, as well as private condo and apartment buildings. If a developer were building a new apartment building with 10 of 16 units being one bedroom, they would not provide anymore than 1.5 spaces per unit. 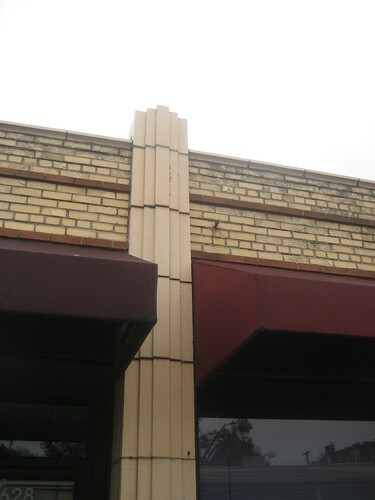 Art Deco detailing of the one story retail building complements that of the larger corner building. 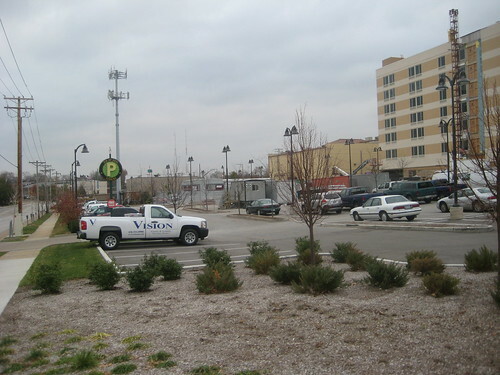 Plenty of parking exists north of the one story building to serve the apartments, and the larger parking area will serve the retail. A candy store in the one story building that is being kicked out, and is moving to the county. 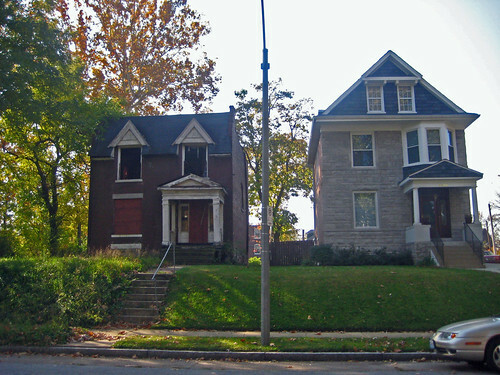 One very positive outcome of the October Preservation Board meeting (where the demo of 921 & 923 Locust were approved) was the Board's voting to deny a demolition permit to the LRA to destroy a home at 6044 Cates in the West End neighborhood. 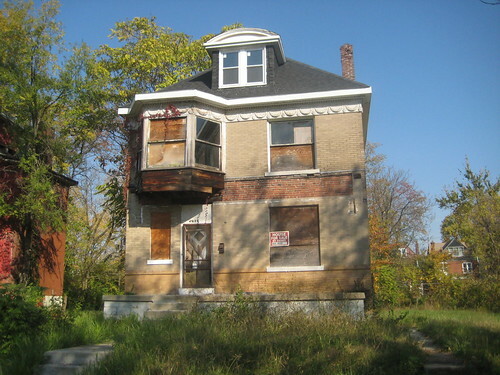 Acting on a request from 26th Ward Alderman Frank Williamson the LRA, who had recently acquired the home from an absentee owner, LRA immediately applied for a demolition permit without first attempting to market the property. The home is located in the Hamilton Place National Register historic district, so demolition would need approval from the Preservation Board (here is the agenda item from the meeting). Fortunately, the majority of board members agreed that the LRA should make an attempt at marketing the building for sale instead of simply demolishing it. 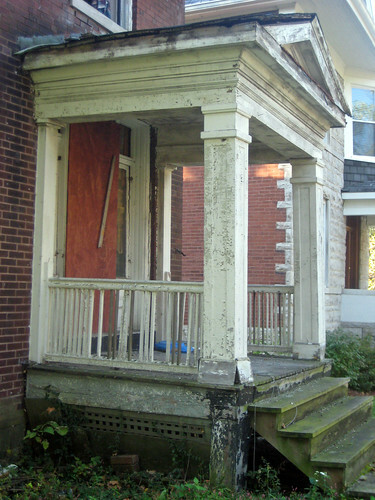 This is the second time the board has voted to spare this home, as the previous owners had applied for demolition in 2007. The home sits near the end of a cul-de-saced block which is mostly intact and has seen many renovations and some new construction in the past several years. Understandably, many neighbors have been upset with the home's condition in recent years and asked the Williams to make it go away. 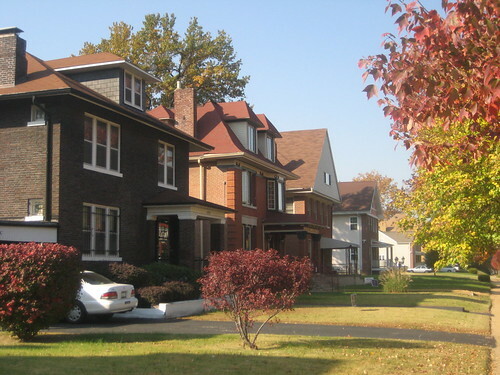 The street's cul-de-sac is at Hodiamont Avenue, which places the home only 2 blocks north of the Delmar MetroLink station and only 3 blocks north of the Loop's east end making it a very convenient location to live. While photographing the home, the neighbor to the west came out on the front porch. She first said she wished the home would get torn down, but after I said it had potential she admitted that she would much rather see the home rehabbed than have it torn down and have a vacant lot next door. She added that her home, which is beautifully maintained once looked like the vacant home, and that she had put a lot into restoring her home. The home is in generally sound structural condition, but needs some masonry work mostly on the rear and east side of the building. 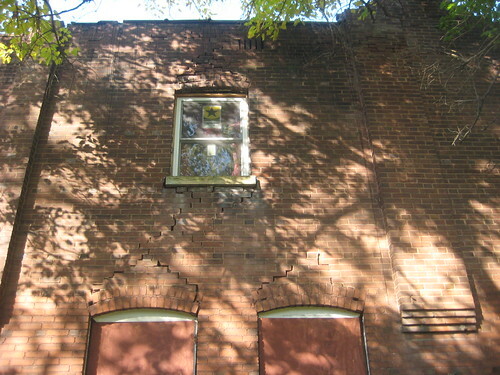 The masonry issues while in need of attention, are not as extensive as seen in many abandoned LRA properties and do not currently threaten the structural integrity of the home. It is apparent that someone started rehabbing the home in recent years, working inside installing framing to furr out the walls and installing windows, when they really should have tackled the masonry shell issues first. 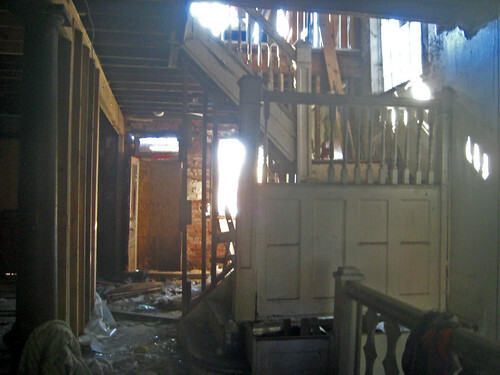 The home's location in a National Register district makes it eligible for Historic Rehabilitation Tax Credits. 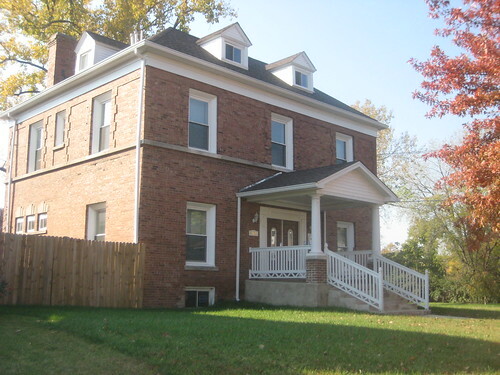 For an owner-occupant buyer, 25% of rehab cost would be returned under the Missouri state tax credit and if a buyer wanted to rent out the home for a minimum of 5 years they would be eligible for an additional 20% tax credit under the Federal program. 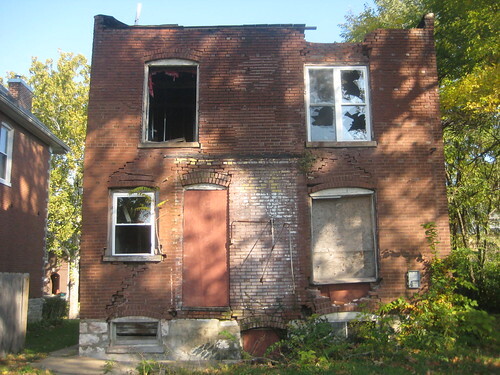 Anyone interested in purchasing and rehabbing the home should take a look at the LRA's web pages that explain the process (LRA is part of the St. Louis Development Corporation, a City agency). 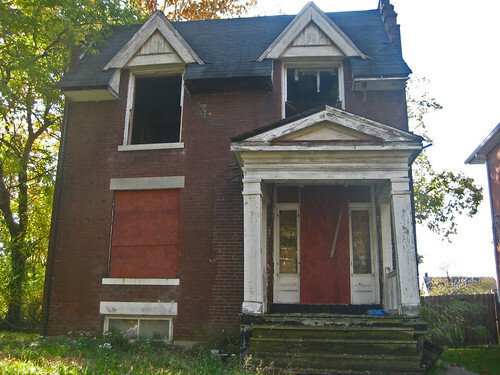 According to the Standard Price List for vacant properties and land, the home would be available for $1,000.00. This reasonable price combined with the tax credit incentives make the property a real opportunity to have a nice home even in these tough economic times. For more photos of the home, see my Flickr set. 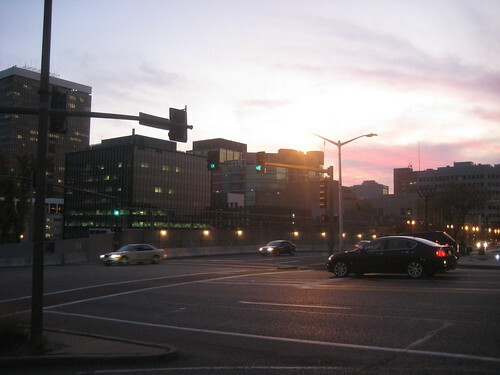 The West End neighborhood where the home is located has seen a huge turn around for the better in the last decade. The mostly intact blocks west of Hamilton which compose the historic district have seen dozens of renovations and infill on vacant lots. East of Hamilton, which had large tracts of vacant land where severely deteriorated apartment blocks were taken down has the construction of well over 100 new homes. 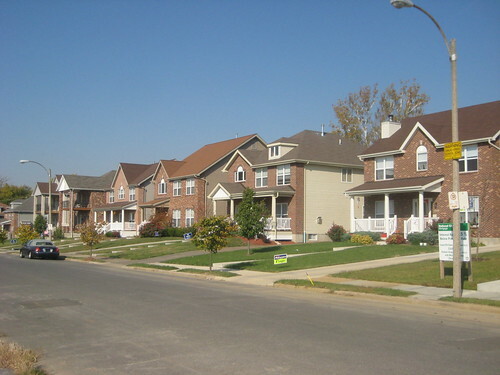 These homes for the most part are not starter homes, and have been successfully marketed to attract upper middle class residents back to the neighborhood. 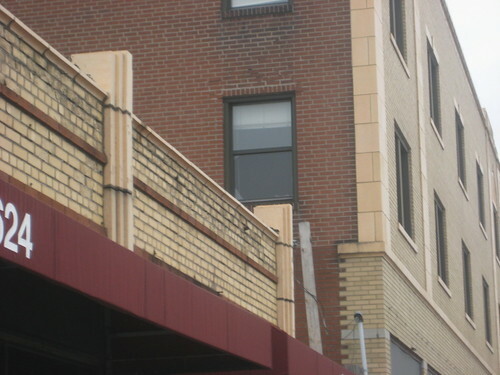 These blocks while having several unfortunate demolitions, have also seen the renovation of many beautiful large homes. 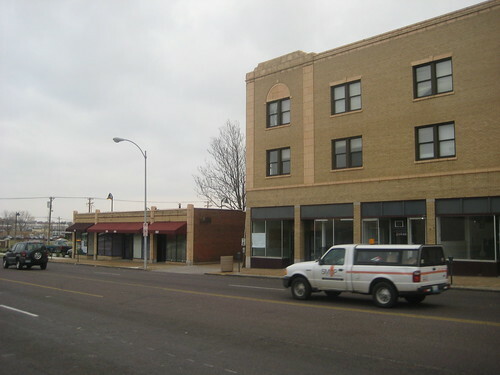 Many rehab opportunities also exist as well, although the blocks east of Hamilton are not covered by the historic district and therefore do not enjoy the tax credit incentives. Centene did not waste any time obliterating the former Library Ltd Building at Forsyth and Hanley. On October 17th, the Post reported barricades were going up around the Harris Armstrong landmark built as the first suburban branch of Scruggs Vandervoort Barney Department Store. By last Friday evening, the entire building was gone. Core 10 Architecture, whose office is directly across Hanley in another MCM building, captured the building's last stand in a video that is now on the front page of their site. 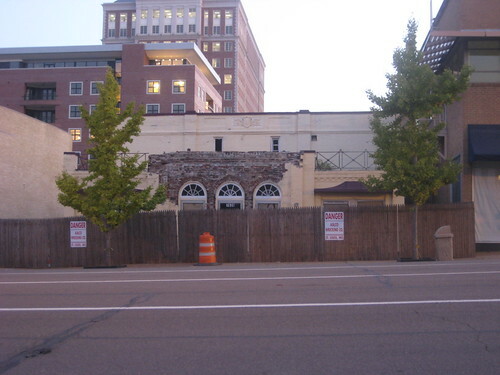 A few hundred feet east, demolition has begun on the Shady Oak, which is being demolished for a new parking lot for the building on the corner. According to Yesterday's Post the theater's distinctive blend of art deco and colonial revival was the work of architects Frederick Dunn and Campbell Alden Scott. Fortunately, our ultimate destination in Clayton that evening The Fatted Calf, which opened in 1969, is still standing, and has thankfully not changed at all under new ownership. Soon the same will not be able to be said of the original Fatted Calf at 10th & Locust Downtown... see previous post.